When it comes to supplying laughs, Iranian-American comedian Maz Jobrani enjoys his share of racial banter.... he delivers jokes rooted in his own heritage, mixing in jabs at his family, upbringing, even audience members. 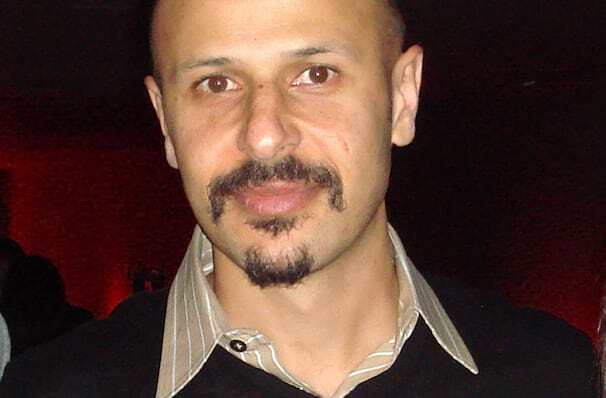 Maz Jobrani is also known as the Persian Pink Panther, a cheeky reference to his Iranian-Persian heritage. A well-tread comedian, he's performed comedy in almost every medium with roles on radio shows, TV sitcoms, talk shows, feature films, and at comedy clubs. If you recognise his face it could be pretty hard to track down where you remember him from! Perhaps a night watching him perform live on-stage will jog your memory. Jobrani moved to the USA from Iran when he was just a kid, and abandoned his PhD studies at UCLA to pursue his dream of being an actor - a move that has served him well with today's current affairs providing a wealth of topics for his race, culture and identity themed routines. He's even part of a comedy tour called the 'Axis of Evil Tour' - a tongue in cheek (or perhaps downright blatant) reference to the media's often very skewed coverage of Middle Eastern cultures. Sound good to you? Share this page on social media and let your friends know about Maz Jobrani at Kennedy Center Concert Hall. Please note: The term Kennedy Center Concert Hall and/or Maz Jobrani as well as all associated graphics, logos, and/or other trademarks, tradenames or copyrights are the property of the Kennedy Center Concert Hall and/or Maz Jobrani and are used herein for factual descriptive purposes only. We are in no way associated with or authorized by the Kennedy Center Concert Hall and/or Maz Jobrani and neither that entity nor any of its affiliates have licensed or endorsed us to sell tickets, goods and or services in conjunction with their events.